Racharla Samrajyam, freedom fighter, died at her residence here on Monday. Samrajyam was born to Goparaju Venkata Subba Rao and Rajyalakshmi at Rajahmundry on April 26, 1919. She was social reformer Gora’s younger sister. Samrajyam was inspired by the Quit India Movement, when she was undergoing Hindi Pracharak training at Anantapur in 1942. She quit the training programme and joined the Quit India Movement. 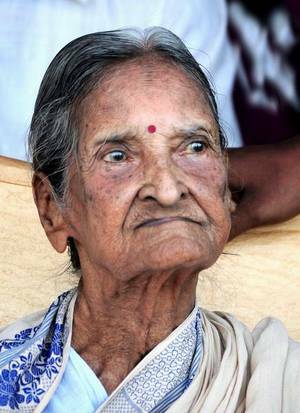 She was arrested at Bezawada (Vijayawada) and was sent to the Raya Vellore Jail for six months in 1944. Motivated by G. Durga Bai, she underwent training in rural development activities for a year in 1945 in Kasturi Ba Smaraka Trust at Seva Gram through the Hindustan Naya Talmi Sangh, under the leadership of Mahatma Gandhi. She had worked in various capacities at the Kasturi Ba Gandhi Rashtriya Smaraka Trust’s Regional Office at Seethanagaram in East Godavari district, serving the trust for 34 years, from June 1946. She received the ‘Tarmra Patra’ from the Government of India in 1972. She is survived by her only son Saranga Rao, who had retired after serving as a Principal at various government junior colleges in Visakhapatnam district.